^ Lilavati Section 6, Chapter 4 (see Knuth (1997)). ^ Muir, Thomas (1904). “Note on selected combinations”. Proceedings of the Royal Society of Edinburgh. doi:10.1017/S0370164600007768. http://books.google.com/books/reader?id=EN8vAAAAIAAJ&output=reader&pg=GBS.PA102. ^ Boardman, Michael (2004), “The Egg-drop numbers”, Mathematics Magazine 77 (5): 368–372, JSTOR 3219201, MR1573776, http://jstor.org/stable/3219201, "it is well known that there is no closed form (that is, direct formula) for the partial sum of binomial coefficients" . ^ see induction developed in eq (7) p. 1389 in Aupetit, Michael (2009), “Nearly homogeneous multi-partitioning with a deterministic generator”, Neurocomputing 72 (7-9): 1379–1389, doi:10.1016/j.neucom.2008.12.024, ISSN 0925-2312 . ^ Ruiz, Sebastian (1996). “An algebraic identity leading to Wilson's theorem”. The Mathematical Gazette 80 (489): 579–582. doi:10.2307/3618534. http://www.jstor.org/stable/3618534. ^ Knuth 1997, p. 30. ^ see e.g. Ash (1990, p. 121) or Flum & Grohe (2006, p. 427). ^ Munarini, Emanuele (2011), “Riordan matrices and sums of harmonic numbers”, Applicable Analysis and Discrete Mathematics 5 (2): 176–200, doi:10.2298/AADM110609014M, MR2867317 . Ash, Robert B. (1990) . Information Theory. Dover Publications, Inc.. ISBN 0-486-66521-6. http://www.amazon.com/Information-Theory-Dover-Books-Mathematics/dp/0486665216. Benjamin, Arthur T.; Jennifer, Quinn (2003). Proofs that Really Count: The Art of Combinatorial Proof. Mathematical Association of America. ISBN 978-0-88385-333-7. https://www.maa.org/press/books/proofs-that-really-count-the-art-of-combinatorial-proof. Bryant, Victor (1993). 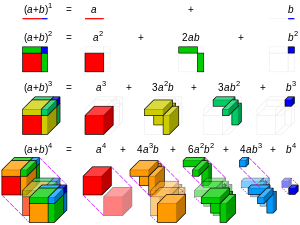 Aspects of Combinatorics. Cambridge University Press. ISBN 0-521-41974-3. Flum, Jörg; Grohe, Martin (2006). Parameterized Complexity Theory. Springer. ISBN 978-3-540-29952-3. http://www.springer.com/east/home/generic/search/results?SGWID=5-40109-22-141358322-0. Goetgheluck, P. (1987). “Computing binomial coefficients”. American Math. Monthly 94: 360–365. doi:10.2307/2323099. Graham, Ronald L.; Knuth, Donald E.; Patashnik, Oren (1994). Concrete Mathematics (Second ed.). Addison-Wesley. pp. 153–256. ISBN 0-201-55802-5. Higham, Nicholas J. (1998). Handbook of Writing for the Mathematical Sciences. SIAM. p. 25. ISBN 0-89871-420-6. Knuth, Donald E. (1997). The Art of Computer Programming, Volume 1: Fundamental Algorithms (Third ed.). Addison-Wesley. pp. 52–74. ISBN 0-201-89683-4. Singmaster, David (1974). “Notes on binomial coefficients. III. Any integer divides almost all binomial coefficients”. Journal of the London Mathematical Society 8 (3): 555–560. doi:10.1112/jlms/s2-8.3.555. Shilov, G. E. (1977). Linear Algebra. Dover Publications. ISBN 978-0-486-63518-7. Andrew Granville (1997). “Arithmetic properties of binomial coefficients I. Binomial coefficients modulo prime powers”. CMS Conf. Proc 20: 151–162. http://www.cecm.sfu.ca/organics/papers/granville/Binomial/toppage.html. この記事は、クリエイティブ・コモンズ・ライセンス 表示-継承 3.0 非移植のもと提供されているオンライン数学辞典『PlanetMath』の以下の項目の本文を含む: Binomial Coefficient, Bounds for binomial coefficients, Proof that C(n,k) is an integer, Generalized binomial coefficients.